Microsoft unveiled three new second-generation Zune models late Tuesday and announced that its online music store, Marketplace, will offer consumers 1 million DRM-free songs for purchase. As nice as it is to have second generation Zune players, it looks like Microsoft is matching Apple’s iPod both in features (hard drive-based and flash-based players) and price points. The hard-drive based Zune 80 sports, naturally, 80 GB of storage. 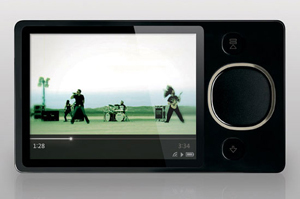 It uses the new Zune Pad, a four-way touch sensitive d-pad for up, down, left, and right functions. Its screen size is marginally larger, 3.2 inches from 3.0, and it’s about 1/3 smaller than the original Zune, which is now known as the Zune 30. The Zune 80 will sell for $250 and will be available sometime in November. Also of interest are Microsoft’s first flash-based models, the $200 Zune 8 and the $150 Zune 4, which store 8 GB and 4 GB respectively. 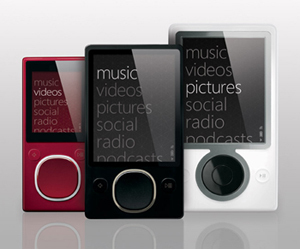 They, too, use the Zune Pad and will feature a 1.8-inch display (compared with the iPod Nano’s 2-inch screen). They will be available in red, pink, black, and green colors. All Zunes, including the Classic, will have a redesigned interface and will be able to sync with a host computer over Wi-Fi, designed so users will always leave home with the latest content, including podcasts. Native video codecs include H.264 and MPEG-4, and users will no longer need to convert those files to WMV for playback. 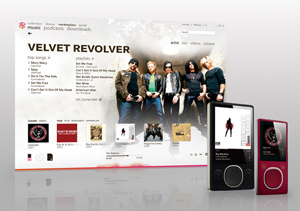 The 3×3 song sharing feature of the original Zune has had its three-day restriction removed, although users can still only play the shared files three times. The Zune Marketplace continues the trend toward DRM-free music offered by online music stores. Initially Microsoft will make available 1 million unprotected songs. Additional details were not released. The Marketplace, however, sells music videos but no movies or TV shows. The new Zune lineup met, at least initially, with a lukewarm reception from analysts, according to CNET. One analyst noted that Microsoft is at least holding its own — vying for the 30 percent of the market that Apple does not own — but it’s not enough to gain ground on the juggernaut iPods and iTunes. For the most part, the newest Zunes do not offer anything remarkably better than the iPod. Another analyst sees the new Zune lineup as “important incremental change.” “What we are waiting to see is more revolutionary changes, such as the ability to access the Zune music service via Wi-Fi,” said Susan Kevorkian, an analyst with IDC. Photo Credit: All images from CNET. New Zunes to be announced tomorrow? Looks good to me. Personally I am sick of Apple’s DRM and forced use of iTunes for their iPod. I am seriously considering getting a Zune now. Just like iTunes and the iPod, Microsoft forces you to use the Zune player to sync the Zune.